Today we’re visiting with Sarah Sequins, “a jewelry designer and artist obsessed with all things sparkly.” Sarah hosts the popular blog Saturday Sequins, where she shares her works in progress, creative inspiration, laughs, and smiles. She is also writing an ebook, but we’ll get to that in a minute. 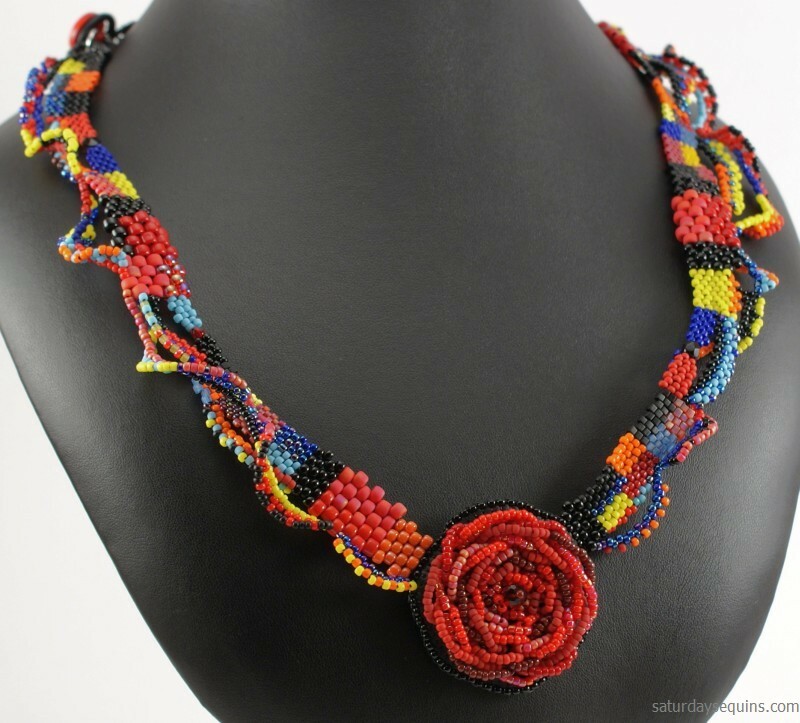 First, let’s talk about bead weaving, bead embroidery, and working with sequins. Museiddity: Hi Sarah! I’ve been happily following your blog for awhile now; eagerly awaiting each week’s inspiring post and pics of your latest masterpiece. How did you become interested in sequins and beading? Sarah: Hi, Robyn! Thank you so much for featuring me! I’m excited that you’ve started this new blog. When I look back, I can’t think of a time when I wasn’t interested in sparkly things. I started collecting them before I even knew what to do with them! The first time I thought of sequins for jewelry making, I was eight or nine years old, and I wanted to reproduce a pair of sequin earrings I’d found at the mall. I taught myself how to work with sequins and chain without any special knowledge or tools – just my little fingers! Around that time, my sister, who’s interested in Native American beading, taught me my very first, simple bead embroidery stitches. She helped me make my own leather moccasins one weekend and let me embellish them with beads. She was the one who introduced me to bead weaving, too – I owe her a lot! Museiddity: I’ll bet they were beautiful! You’ve often used the terms “bead and sequin embroidery” and “bead weaving,” what is the difference? Sarah: Both types of bead work involve a needle and thread. The difference between bead embroidery and bead weaving is that embroidery involves passing the needle through a backing – usually some sort of fabric or felt. Bead weaving, on the other hand, doesn’t use a backing; jewelry and other items are made by passing the needle through the beads themselves, and sometimes the thread. Both bead embroidery and bead weaving have different stitches and variations. They overlap in a few places, though, which makes it a lot of fun to experiment with combining them. Museiddity: Many of your beading designs include sequins, what skills and materials do we need to work with them? Sarah: For very basic sequin embroidery, you really don’t need much. Some sequins, a beading needle, some thread (I like Fireline, but mercerized cotton is fine, and so is nylon thread, or Nymo). Something to sew them to. If you can pass a needle through it, you can sew sequins and beads to it! I suggest something stiff like craft felt, buckram, Lacy’s Stiff Stuff or Nicole’s BeadBacking when you start out, though, just because fabric can pucker if you pull your thread too tight. Stiff material prevents that. As for skills, if you can sew a simple stitch with a needle and thread, you can sew a sequin! After that, the stitches tend to build on each other – if you can do one, you can figure the rest out. Museiddity: Some sequins have no hole, how would we apply them? Sarah: Most, if not all, of the sequins I buy have holes – I’d love to find some without holes and play around. But! There are plenty of times when I find shiny, sparkly bits of confetti in craft and hobby stores and want to turn them into sequins. To do this, I use a 1/16 inch circular hole punch, especially the Fiskars brand. I’ve also drilled sequins with a hand-held drill before, with mixed success. It’s hard to drill more than one at a time because they tend to slide around, even when I used a vise or tape them together in a bundle. I’m still trying to figure things out – but that’s part of the fun. It sounds like this has been quite a journey for you! What surprising things have you learned about yourself by beading? Sarah: I’ve learned a lot about my own learning style. I used to call myself a verbal learner, but really, I’m a tactile learner. I learn by diving in with a basic, bare bones knowledge, making tons of mistakes, and then coming back to books, tutorials and classes when I need to refine my technique. When I let myself learn this way, I’m a fast learner, too – which is really exciting! I’ve also learned that I’m surprisingly patient and detail-oriented while I bead. I would have never used those words to describe myself in other aspects of my life! Now that I know they exist, I’ve started to apply them to other areas, including non-creative ones. Museiddity: That’s the beauty of art, it reflects back to us parts of ourselves we don’t normally see. Sarah, if someone is interested in working with sequins, how would you suggest they begin? Sarah: I have two answers to this question. This first is to dive in, play around, and see what happens. It’s a lot of fun, and it’s a great way to come up with your own innovative techniques – especially if you’re familiar with other types of arts/crafts. You can always bring your past experience to your work. Not everyone learns the way I do, though. For people who need a little more direction, Stanley Levy’s book Bead and Sequin Embroidery Stitches is the best I’ve found. It’s very, very thorough, and the photos are absolutely gorgeous. His book is more for garment-makers, but most of his techniques translate to jewelry making. Museiddity: Will you share a picture of one or two of your favorite pieces? Sarah: Of course! Here are two photos of some of my favorite pieces. 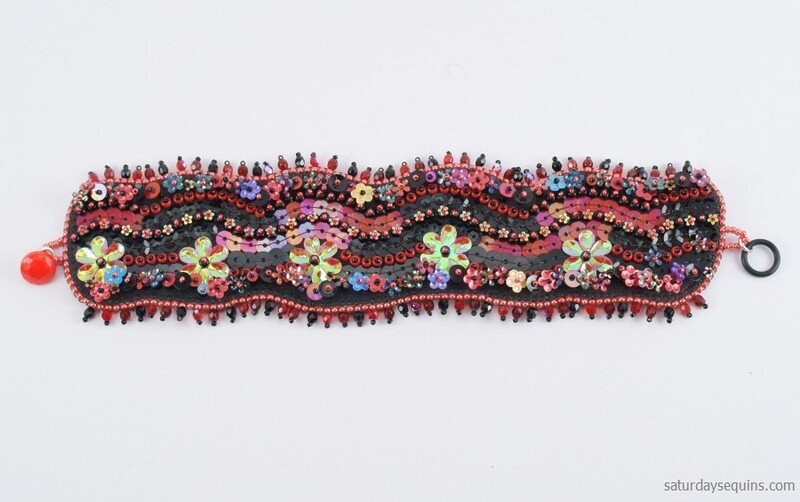 The one with the red flower is called Floral Fiesta, and it’s a mix of bead embroidery and bead weaving. The second one, the bracelet, is called Goth Birthday Cake because when it’s fastened, it looks just like a birthday cake for Morticia Adams. Museiddity: They’re both so beautiful…and the necklace is so intricate! You weren’t kidding when you said you were patient. Thank you, Sarah, for visiting with us! Connect with Sarah: You can keep up with Sarah Sequins at her blog, Saturday Sequins, or at her Etsy shop. Sarah is writing an ebook! Embracing your creative side can sometimes be a struggle, especially if you desire to support yourself with your gifts. To help, Sarah’s book addresses the emotional side of making a creative living. Modeling the book after some of her most popular posts like Don’t Give Up and Instead of Giving Up, Sarah offers much needed inspiration to keep on truckin’. The book is scheduled to launch on July 6th; visit Sarah at Saturday Sequins for more information. Do you love sparklies, beads, or raisins? If so let us know; we love comments and questions! This is a really beautiful piece. I wish my beading looked like this!